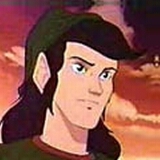 Link was voiced by Jonathan Potts. He was Kevin's favorite video game hero back on Earth and Kevin considers it a great honor to meet him. Link is sarcastic and dislikes Kevin at times but he and Kevin both are able to work together when they really need to.